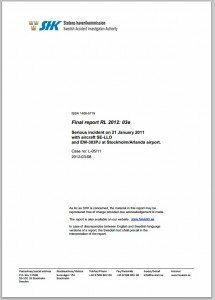 A report issued by the Swedish Accident Investigation Authority (SHK) concludes that the late decision by to go around caused a near miss between two airliners at Stockholm-Arlanda Airport, Sweden. 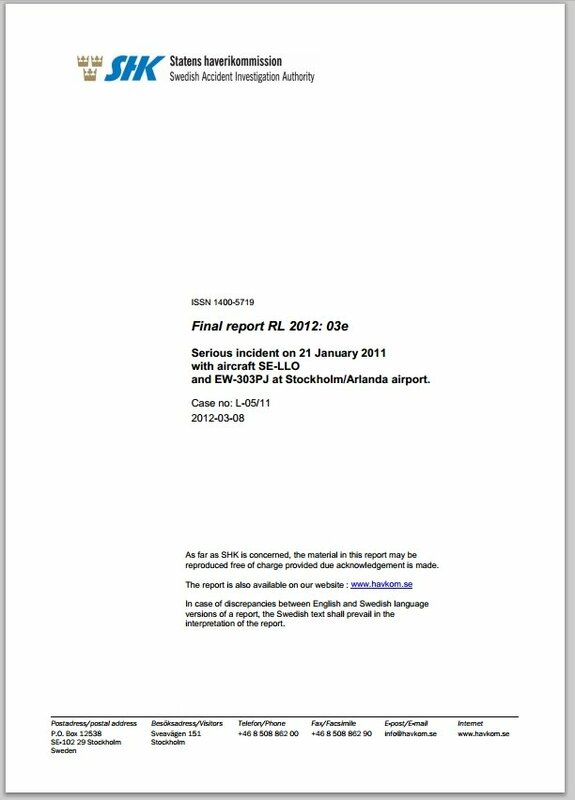 On January 21, 2011, a Belavia CRJ200 was on final approach to runway 26 after a scheduled flight from Minsk in Belarus. The co-pilot was Pilot Flying. The Commander judged that a safe landing could not be performed, and therefore took the decision to abort the landing. During the go around the Commander also took over the control of the aircraft. The go around was initiated approximately 2.3 kilometres from the published missed approach point. The Commander’s taking over the controls at a late stage probably resulted in his not having sufficient remaining capacity to immediately follow the published missed approach procedure. At the same time a Next Jet BAe ATP aircraft took off from runway 19R. At missed approach to runway 26 right turn should be carried out as soon as possible in order to avoid conflict with departing traffic from another runway. The aircraft that aborted the landing followed the prescribed procedures for missed approach only after three calls from the controller. Although the conflict was observed by the air traffic control – and the departing aircraft had been instructed to change its course — a separation infringement occurred. Minimum distance when the aircraft were on the same altitude was 1.38 Nm.